Fans of Bleach have gotten the chapter a little early with chapter Bleach 652. This chapter largely surrounds Nanao and Shunsui along with Lille as we visit the past to see what really happened. If you don’t want to know what happens, stop reading here, if you don’t mind the spoilers, keep on reading. 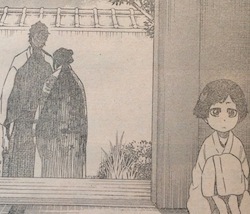 Bleach 652 begins with Nanao as a child, she overhears her mother talking to a man with a hairpin. This man being Shunsui. She notices that her mother gives Shunsui Hakkyouken for safe keeping. When Nanao gets a little older, she becomes a Shinigami even after she was never given a Asauchi. She is quickly accepted into Squad 8 thanks to her Kidou mastery alone. This is where she meets the man with the hairpin, it being Shunsui. Sometime later we see Shunsui and Ukitake talk about Nanao’s mother execution as an order comes in from the Central 46, for stealing the Hakkyouken treasure sword. 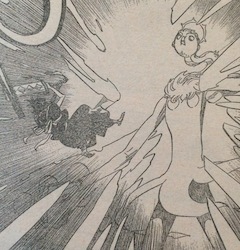 We return to the present when we see Nanao use her sword to cut off Lille’s arm with the sword she holds. However, it’s not enough kill him. While Lille powers up for a new attack against her, Shunsui steps in to help her out. 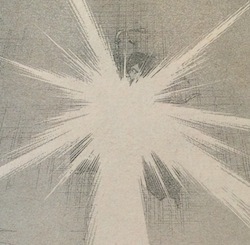 Bleach 652 ends here. Opinions? 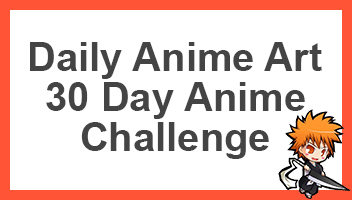 Post it down in the comment section below. When the chapter has been released properly, I will do another post for it as soon as I can, either being today or tomorrow. So I was right. Shunsui is actually her father. That would explain why she was so young 110 years ago and a member of the 8th Division. I think it’s possible Lisa is her cousin cause she looks alot like her. I’m glad Shunsui is helping, Lille is too powerful for Nanao to fight by herself. I don’t think she’s the daughter but in fact the neice. His older brother is the father I believe. I think after she was executed, he wore the flower robe to remember her. Oh. Well I thought he was. Because he was a child when Nanao’s mother was married to his older brother. 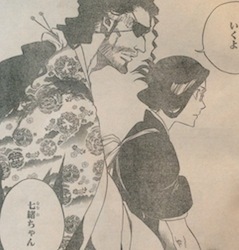 Nanao was a child 110 years ago and Shunsui was wearing a different pink Kimono. I guess Nanao is older than we thought? I always like kubos flashback but right now it feels like they come out of nowhere without forshadowing them. I felt the same with Ukitakes flashback, i know he has to make it so that the Plot progresses well but revealing all the back stories in the war arc when he could have somehow explained/forshadowed them in older chapters…What do you think? This flashback wasn’t foreshadowed I agree. Ukitake’s was actually. He said he would explain why he is sick and we’ll as why Shunsui wears a woman’s kimono and hair pin. He didn’t foreshadow that Nanao would be involved his flashback. I don’t mind it, but I don’t believe he’ll do it again I hope. He did foreshadow that Nemu and Mayuri will have a flashback. I’m expecting one for Pernida as well in the near future. I’m hoping Lille gets a flashback. It really doesn’t all agree with you. But I’ll explain what I think. Shunsui did say he and his older brother did not get along at all. It wasn’t until he was married that they started to get along. That was thanks to Nanao’s mother. She clearly was the one that brought these two closer. She and Shunsui must of had a good relationship. After all, she trusted only him to hide the Zanpakuto Shinken Hakkyouken and look after Nanao, which he did by making her apart of the 8th Division than the Kido Corps like she wanted. I also thought Shunsui had a dead wife or lover. But come to think of it, does Shunsui really seem like the married type? He was and always will be a player in my eyes. His relationship with his Zanpakuto Katen Kyokotsu kinda reflects on that. If anyone seems like the married type it’s Jushiro. Not only does Kyonie have a crush on him, but so does her older sister Isane. I remember the Shinigami short during the Zanpakuto Rebellion arc, and Shunsui and Jushiro were staying in the 4th Division. Jushiro and Isane were talking and flirting with each other in a cute way. Than Shunsui showed up and ran into Unohana’s room were she punched him.